This design was adapted from a simple cocktail napkin that will be shown in class. It was chosen as a vehicle to teach diaper patterns, and students will explore both tent stitch and texture stitch diaper patterns in creating the project. The design incorporates both conventional diapers (those that form solid fillings with traditional canvas stitches) and unconventional diapers (those with open backgrounds formed with counted thread techniques like pulled thread, darning, and blackwork as well as with open canvas networks). A class discussion on the definition and proper identification of diaper patterns in canvas embroidery will be included as well with particular emphasis on distinguishing them from groundings and stripes. The stitched areas are created with a bold outline that is charted rather than drawn. Students will execute this segment prior to class. A prework packet will be sent to each student as soon as the class list of names and addresses is received (or groups may opt to distribute the materials themselves and receive a discount on the kit instead). 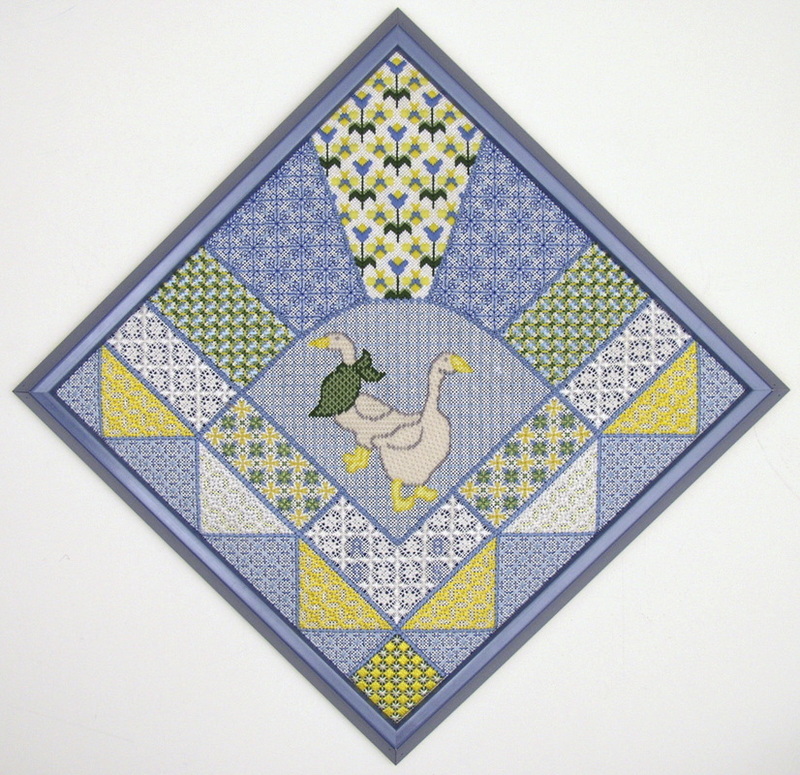 The duck motif in the center is optional, and students are encouraged to substitute either a monogram or alternative design to personalize their own piece. The threads used in this project include Orchidee embroidery yarn, Marlitt, Kreinik pearl metallic, DMC floss, and DMC pearl cotton in both size 5 and size 8. COLOR CHOICE: Three color choices are available for this design: blue-yellow, blue-coral, or pink-yellow (all choices have green and white accents as well, but the dominant color is the first one listed). PREWORK: The main outlines must be stitched prior to class. Estimated time: 8-10 hours. To introduce students to diaper patterns and to show how both traditional solid and open patterns can be developed on canvas. TEACHER PROVIDES: Complete kit that includes all materials needed to execute the design, comprehensive instruction booklet, and colored photograph of the model. STUDENT PROVIDES: 16" X 16" stretcher frame, 2 HiLiter pens, a laying tool, embroidery scissors, a medium value basting thread, a clamp or weight to secure the frame to a table, and a lamp/magnifier, if needed, along with an extension cord. TEACHER'S CLASSROOM NEEDS: Blackboard, eraser, and chalk preferred (marker board acceptable alternative). U-shape arrangement for student tables if possible. Need large table somewhere for exhibit of visual aids. Small table in front near board for teacher's notebook and stitched model.